When you walk through your garden or a park you can see different types of bees pollinating flowers. There are more than twenty thousand varieties of bees throughout the world. They include honey bees, bumble bees, mining bees, sweat bees, leaf cutter bees and many more. They range from the arctic tundra to Africa. The largest honey producing part of the world is Asia. They collect nectar and pollen from flowers. Social bees, such as honey bees, live in a colony. The colony has a queen, workers and male drones. All female solitary bees lay eggs. Solitary queen bees build their own nests like birds do, with one female laying eggs and raising them to maturity, while others live in hives with workers with different duties. Even if they are solitary, bees tend to nest near each other. In Colorado we have several native bees. 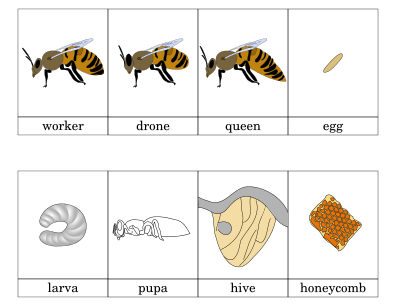 Most of the native bees are miner bees. There are also many beekeepers that use the European honey bee. Even though they are not native bees, they are a large part of the American bee scene since they produce honey for us. The European bee was brought to other places in the world by European settlers.